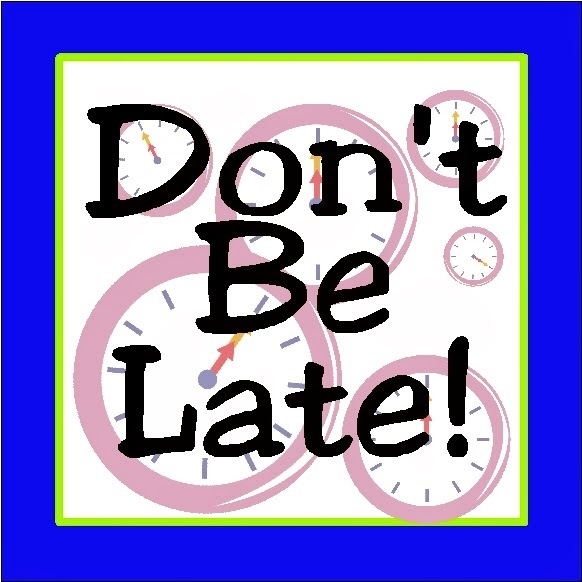 Don't be late to the linky party! Be one of the first and get your blog post seen by everyone who's anyone. It's easier than you think to be organized and run your blog on the go. I have to admit that I'm glad that summer is slowly winding down. I'm ready for the fall holidays and the themed crafting. I think I may have a form of Crafting ADD in that I like to jump all over the place with trying new mediums and doing new ideas. It's kind of hard to keep my brain focused, which is why I have structured my blog to concentrate on one theme from beginning to end. I'm not sure it's the best blogging style since it seems that a lot of readers like to jump in to get ideas for whatever party theme they are working on and then run off to find more ideas or start creating projects. I am totally fine with that, but it means I have to constantly work to get my new ideas out into cyberspace for readers and creaters to find. Which is why I absolutely LOVE blog linky parties. They are such a great way to pin new ideas, meet new friends, and get that blog post that I love out to where people can see it and remember it for when they need it. If you are into blogging at all, you have seen these parties and read the posts on how to make your post stand out in the crowd. You need to have good pictures, creative tag lines, and get to the party early enough to count. While I am no expert at the first two, I have learned how to get to the party early and my page views have really benefited from that. There are thousands of blog parties out there with each one on a different day and starting at a different time, so it's really important to be able to find a system that works to keep each blog linky straight so I can be the first to the party. That took me some serious trial and error to figure out. I finally found the LocalCalendar.com website. (I am not an affiliate or anything, I just LOVE their service.) It is an easy web calendar that allows me to add each of my favorite blog linky parties. I can add all kinds of information to the entry so that I can know the name of each party, where it links up, the day and time that it starts, and any other information that I want to add. I try to add little notes to the entry if the party has a specific theme or I put an astrix by the party name if it's a group linky party so I can remember to try and get there first. Since I always have my phone with me, I attend a lot of blog parties on there. So to help me, I always have two windows up in my phones browser. One has my Blog Linky calendar (I posted it on the "Linky Parties" page on my blog so I would always have access to it) and the other has my most current blog post. This allows me to quickly access the calendar when I know a blog party is about to start. 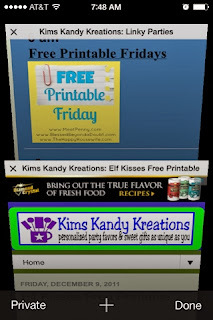 I can bring up the page and click on the next linky party. Since I already have my post qued up and ready to go, I can quickly jump into the party and add my blog post. Sometimes, the blog owner doesn't have a set start time, will start the party early, or I haven't quite pinned down the exact start time yet, so I will try and look ahead an hour or two in the party calendar to check out the upcoming blogs when I'm standing in the grocery store line, waiting to pick up my kids, or just sitting at work during a quiet moment. This system has worked wonders for me in my party attendance, and my blog views. 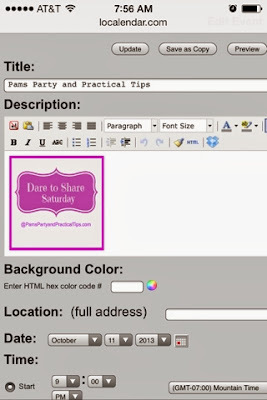 If you want to see where I like to party, check out the Linky Parties link on the toolbar above. And be sure not to miss our Dare to Share Saturday linky party each Friday night at midnight EST. What a nice surprise to see my name and button as an example in your post.. :) I will have to try that calendar, because I really like visual reminders.. I know exactly what you mean about the crafting ADD, I do that not only with crafting but everything... I found out only 2 years ago when my youngest was diagnosed with real ADD that I had it too.. I had no idea for 40+ years, but once I found out things definitely made sense.. This is such a great idea! I have such a hard time remembering when to link up but I am just getting started. Thanks for the tips. I will be pinning! Oh my this is amazing!! I am struggling to keep up with all the link parties I link up to since I am relying on reminders on my phone and it doesn't always work. Thanks for this. PS: Visiting from Marvelous Monday! I did the same thing. I think I've tried all the ways to be able to remember the parties, lists, alerts, post in notes..you name it. Finally I just started checking my calendar every hour or so to see if there were any coming up and it just got easier to be on time. I hope this helps you too! Let me know how it goes. I will definitely stop by your linky and add you to the calendar. Thanks so much for stopping by and for the invite. Thank you so much Kim, for sharing your wonderful experience with Local calendar.com. I too, struggle to keep intouch with the linky parties and before you know it, your the 331st visitor to the party !!!! Will give your idea a go and lets see how it works. I hear you! Sometimes I'm only a few minutes late and am number 50 on the list. It can be easy to get lost in the crowd. I hope this calendar works for you. It's done wonders for me! This looks really helpful, I'm not super organized so maybe this is something I need to try! Thanks again for joining the Link Up! Thank you for sharing this. I am new to blogging and try to be seen. This post is really going to help me. Thank you for coming over to our blog and linking up and thank you for the great post! This is a great idea.